On Apr. 7, a U.S. RC-135U spyplane, was intercepted over the Baltic Sea, off the Russian exclave between Poland and Lithuania on the Baltic, by a Russian Su-27 Flanker fighter jet scrambled from Kaliningrad Oblast. The Pentagon protested for the “reckless” and “unprofessional” behaviour of the Russian pilot who buzzed the U-Boat (as the RC-135U is nicknamed in the pilot community) and flew dangerously close to the American aircraft. Russia’s Defense Ministry said the RC-135U was intercepted because it needed to be identified as it was flying with its transponder switched off (just like all the Russian warplanes operating over the Baltic Sea and near UK) even though the spyplane’s Mode-S transponder could be detected by ADS-B receivers, according to Flightradar24.com. Few days ago, a former RC-135 aircraft commander who flew the S, U, V, W, and X models, sent us an email and gave his point of view about the “U-Boat” intercept. “About the RC-135U intercept last week, the absence of a transponder signal is a non-issue. Having flown many of these missions, we used the concept of “see and avoid” where the pilot flying is responsible for avoiding all traffic conflicts, much like a VFR flight plan without flight following. Given that the intercept took place in VMC there is simply no merit in the Russian accusations that the U-Boat was flying without an active transponder and therefore a dangerous risk. The close proximity is equally moot. Prior to the end of the Cold War interceptors from a variety of nations managed to get into tight formation with RC-135s and EP-3s. Smaller airplanes like MiG-21s made it easy. 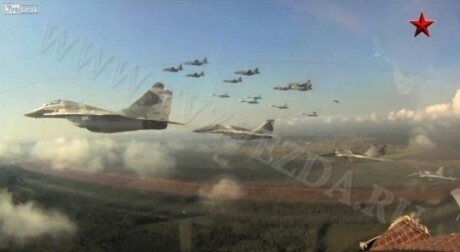 The challenge with the larger airplanes like the Su-27 and MiG-31 is the sheer size of the interceptor as it moves in front of any portion of the intercepted plane. At least the Su-27 pilot has excellent all-around visibility to see where the back end of his own airplane is as he maneuvers adjacent to the RC-135.